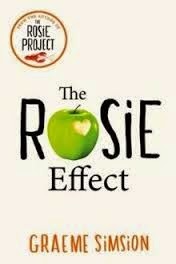 The Rosie Effect by Graeme Simsion is a sequel to The Rosie Project which was a fun book. I'm glad I took the risk of reading the sequel (so often they are not great) based on the reviews of Shirley from My Bookshelf and Hannah of What Hannah Read. Thanks! Even though the reviews were mixed – and I can see why, I unhesitatingly recommend this to everyone who like the first book. From the very start you are gripped by the world as seen by the protagonist – Don Tillman – a scientist with limited people skills. By seeing things through his eyes you start to realise just how many things we do or say are not in fact strictly logical! It's not all side splitting but it sure had its moments. Read it and prepare to be charmed and amused. That's an intriguing review. The books sound like they might be worth looking up!